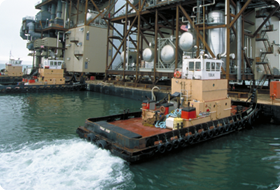 The authors cover in considerable detail the methods which are used to maneuver tugs and tug/barge combinations. The book covers Boat Handling; Towing Equipment; Ocean Towing; Towing and Maneuvering in harbors, bays and river; Towing close astern, North American, Canadian and European approaches; Multiple barge towing; Emergency ship towing; Dead ship towing; Watch standing priorities when towing; and Command. This article, written by George and Grant, underscores the need for specific training regarding the need for deliberate calm during crisis situations at sea. This article, written by George, seeks to define and defend the role of the pilot worldwide, regardless of region. To order the book please visit The Nautical Institute and enter “Tug Use” in search box. Each piloting group/region has expertise and shiphandling techniques that can be shared to the benefit of all. Copyright © 2010-2011 Ship and Tug.com All rights reserved.